In situ viewing ports allow visitors to see archaeological remains of Franklin's house. Designed by the architectural firm of Venturi and Rauch (now known as Venturi, Scott Brown and Associates), Franklin Court is a museum and memorial to Benjamin Franklin sited in Philadelphia’s Independence National Historical Park. The complex was constructed on the site of Franklin’s home and includes a 30,000- square-foot underground museum, topped by two "ghost houses" approximating full-scale representations of Franklin’s house and adjacent print shop. The original Venturi and Rauch project, completed in 1976, also involved work to reconstruct five adjacent period houses and was completed in anticipation of nationwide Bicentennial celebrations. Today, the original design intent for Franklin Court is being threatened by a proposed renovation of the museum. Two steel “ghost” structures, representing the original house and print shop, enclose the courtyard. During the early 1970s, the National Park Service engaged the architecture firm of Venturi and Rauch to undertake the design and construction of a complex that would honor one of the Founding Fathers of the United States, Ben Franklin. Sited along Independence Mall on the historic location of Ben Franklin’s home (constructed in 1765 and razed in 1812) and adjacent print shop, the memorial and museum would serve to recognize Franklin’s contributions to this country’s history and educate future generations. The challenge was to design a contextually appropriate but distinctive structure that would imaginatively convey the site’s rich history. To meet the challenge, the design places the main exhibit area underground and presents two steel “ghost” structures above ground to represent the original house and the adjacent print shop, leaving the location of Franklin's garden as open space. The entry to the memorial is through a passageway under these structures that offers a sense of discovery and drama, of both physical and temporal movement. The inner court's landscape design recalls an 18th century garden while providing comfortable yet durable visitor accommodations. As much care was taken with the design for the museum entrance from the court. As Denise Scott Brown states, “The ramp felt like a Colonial road, possibly descending to the Delaware” (see full letter in sidebar). This concept continues today as a defining feature of the site. Viewing ports in situ allow visitors to see the few archaeological remains of the house unearthed during earlier research. Quotes from Franklin's letters to his wife during the house's construction are incised in the paving. The design of this public space also serves to build upon the Greenway plan for Society Hill developed by Edmund Bacon a decade earlier. Working with the Philadelphia Planning Commission, Bacon utilized urban renewal funds to demolish dilapidated wharf buildings and warehouses and rehabilitate the cornerstone of Philadelphia’s Society Hill: its Colonial roots. John Milner and Associates reconstructed five Colonial houses that once faced Market Street as part of the Franklin memorial project. With these structures providing the visual context, the design for Franklin Court takes advantage of Bacon’s work to revive the neighborhood by seamlessly integrating with his system of pedestrian greenways a route that extends across the site between Market and Chestnut Streets and engages the entrance to the museum. This seamless integration encourages all visitors and provides a literal reflection of the democratic ideals presented at Independence Mall. As Maurice Harteveld writes “new public spaces would symbolize civic society as, one, dominantly present since The Enlightenment and, two, underlying the existence of the United States of America” (see full letter in sidebar). Since its completion, the project has been recognized with several awards from the American Institute of Architects, including the 1977 National Honor Award, and, in 1984, the firm received the Presidential Design Award and Federal Design Achievement Award for the design. This project has for years been considered a basic text for students of architecture worldwide. Today, Franklin Court is one of the most visited attractions in Independence Park. During lunchtime, the park is not only used by visitors, but by residents and workers from surrounding office buildings. As in Franklin's day, the space continues to serve as a quiet oasis in the midst of a bustling commercial area. 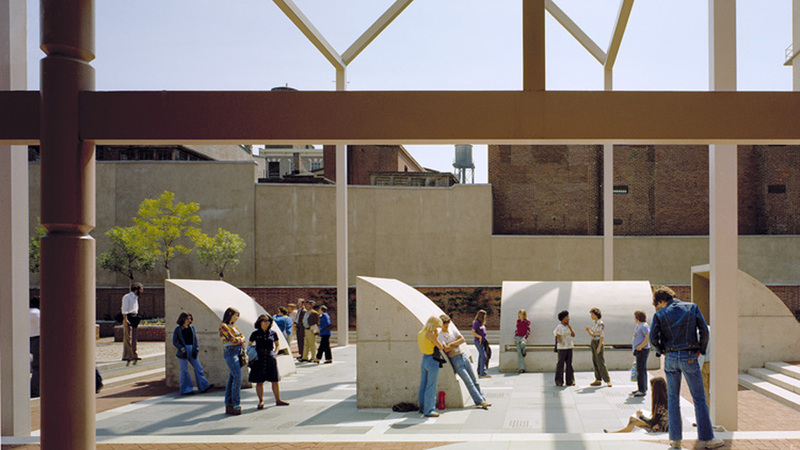 In the larger context, Franklin Court and Welcome Park in Philadelphia are unique interpretive designs by Venturi, Scott Brown and Associates that reclaimed urban spaces while transforming them into public and community plazas. Informal benches along the museum wall engage pedestrians. The National Park Service has presented a rehabilitation plan for the underground museum at Franklin Court. While the proposed plan does not address the courtyard, it alters the relationship between the museum entrance and the “ghost” structures, thereby blurring their significance as well as the general procession into and through the museum. This plan also calls for the replacement of the informal benches along the outer wall with an enclosure that encroaches into the open space. As Mary Anne Piacentini states, “One should employ the utmost discretion and restraint in attempting to alter even its least prepossessing features. Regrettably, the “improvements” currently proposed militate against the very qualities that make it an instructive environment of special quality, both locally and nationally” (see full letter in sidebar). To address these potential threats, the stewards should undertake a cultural landscape report to guide and manage future alterations to this potentially significant historic designed landscape. The National Park Service period of comment for this project end May 15, 2010. The public is encouraged to submit comments in support of a more sympathetic design to the National Park Service and copy members of the Senate Committee on Energy and Natural Resources and the House Subcommittee on National Parks, Forests and Public Lands. Photos by Mark Cohn. Images courtesy Venturi, Scott Brown and Associates, Inc.